The Nestle Gerber Good Start Soothe 12.4oz Powder Each, Model #5000062400, is anchored in advanced science and research. Nestle Healthcare Nutrition offers nutritional solutions for people with specific dietary needs related to illness, disease states or the special challenges of different life stages. 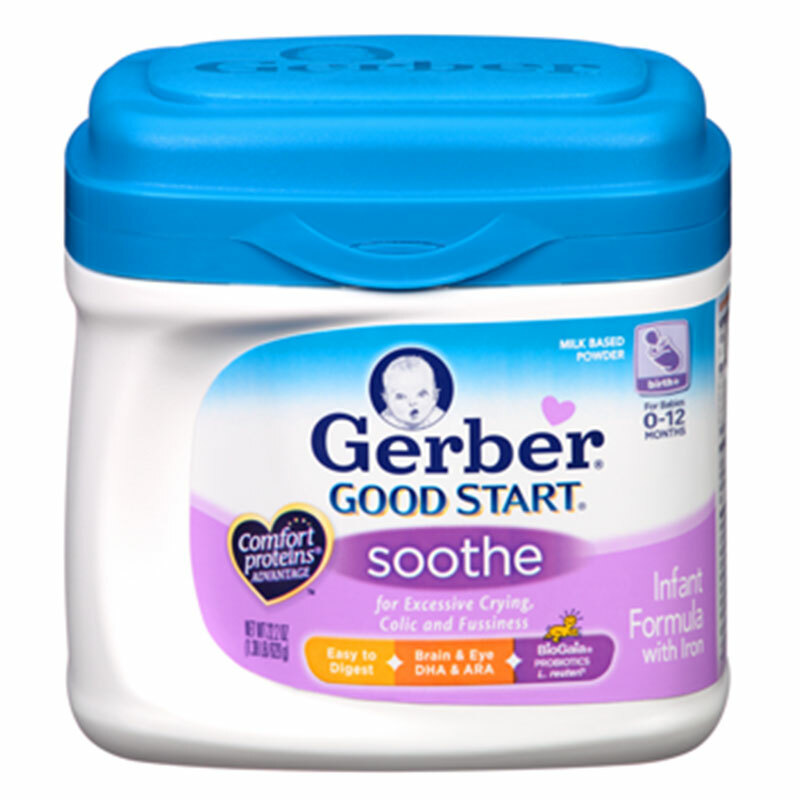 The Nestle Gerber Good Start Soothe 12.4oz Powder Each is an ideal formula to switch to because it is specially designed to ease excess crying, colic and fussiness while providing complete nutrition for the first year of life. Common feeding issues like excessive crying, colic and fussiness can be contributed to your baby's developing digestive system. Nutrition designed for babies 0-12 months experiencing excessive crying, colic and fussiness. Exclusive probiotic L. Reuteri, that has been clinically shown to reduce crying time by 50% in colicky breastfed infants. Carbohydrate blend with 30% lactose to help ease fussiness and gas. Ingredients: CORN MALTODEXTRIN, WHEY PROTEIN CONCENTRATE (FROM COW'S MILK, ENZYMATICALLY HYDROLYZED, REDUCED IN MINERALS), VEGETABLE OILS (PALM OLEIN, SOY, COCONUT, AND HIGH-OLEIC SAFFLOWER OR HIGH-OLEIC SUNFLOWER), AND LESS THAN 2% OF: POTASSIUM CITRATE, POTASSIUM PHOSPHATE, CALCIUM CHLORIDE, CALCIUM PHOSPHATE, SODIUM CITRATE, MAGNESIUM CHLORIDE, FERROUS SULFATE, ZINC SULFATE, COPPER SULFATE, POTASSIUM IODIDE, MANGANESE SULFATE, SODIUM SELENATE, M. ALPINA OIL*, C. COHNII OIL**, SODIUM ASCORBATE, INOSITOL, CHOLINE BITARTRATE, ALPHA-TOCOPHERYL ACETATE, NIACINAMIDE, CALCIUM PANTOTHENATE, RIBOFLAVIN, VITAMIN A ACETATE, PYRIDOXINE HYDROCHLORIDE, THIAMINE MONONITRATE, FOLIC ACID, PHYLLOQUINONE, BIOTIN, VITAMIN D3, VITAMIN B12, TAURINE, NUCLEOTIDES (CYTIDINE 5'-MONOPHOSPHATE, DISODIUM URIDINE 5'-MONOPHOSPHATE, ADENOSINE 5'-MONOPHOSPHATE, DISODIUM GUANOSINE 5'-MONOPHOSPHATE), ASCORBYL PALMITATE, MIXED TOCOPHEROLS, L-CARNITINE, SOY LECITHIN, LACTOBACILLUS REUTERI (DSM 17938) CULTURES.